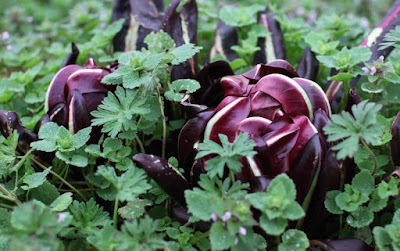 Production of leaf or salad chicories, marketed as radicchio to give them an Italian burnish, are an important commercial crop in Italy and California. 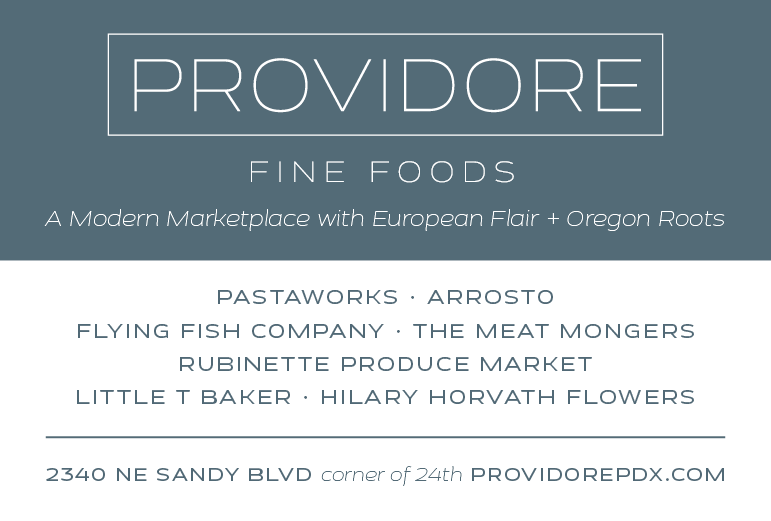 The producers rely on proprietary seed production. 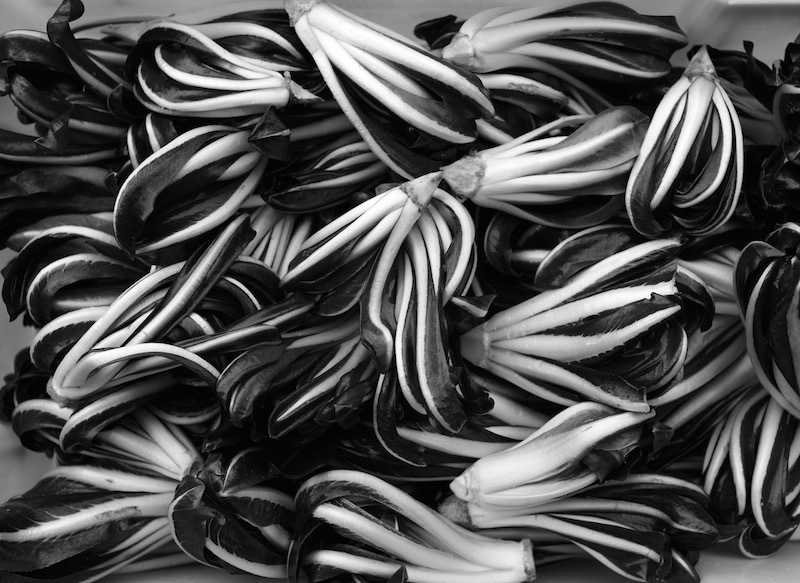 For example, the late Treviso chicory growers’ consortium cooperatively funds seed production for their storied Tardiva. This assures them the necessary consistency and reliability. That carefully produced seed is unavailable to other farmers. Stymied by the sharp decline in the consistency and quality of the publicly available seeds of the late Treviso type, with less than 10 percent of the resulting crop resembling the Italian version and the off-types often unsaleable, we either had to walk away from the crop or produce our own seed. Affection ruled the day. We decided to extract our own selection from the infuriatingly messy genetics enclosed in those seed packages. 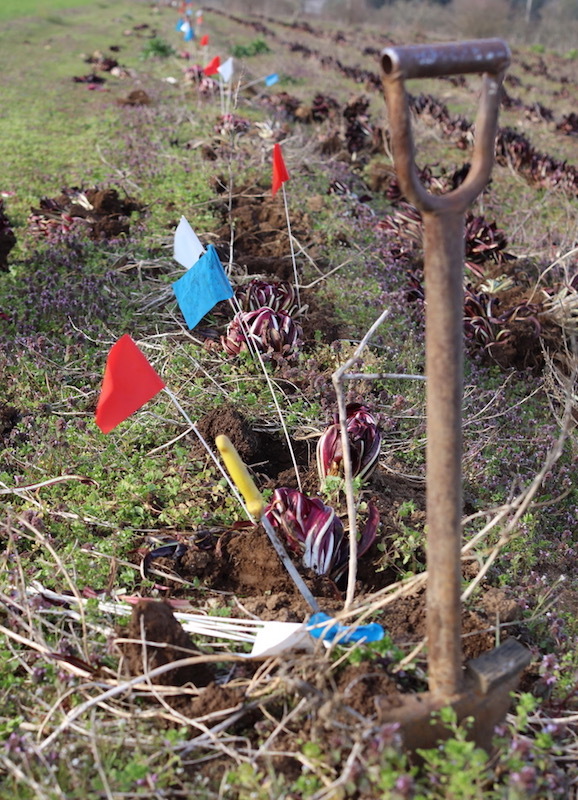 Late winter chicory seed production is not for the impatient farmer. The crop is planted in the early summer, the new seeds are harvested midsummer a year later, in the summer of the following year those seeds are planted and in February of the next year the results are evaluated, a project of nearly three years. The necessary patience springs from enjoying a brightly colored chicory salad on a dreary February day. 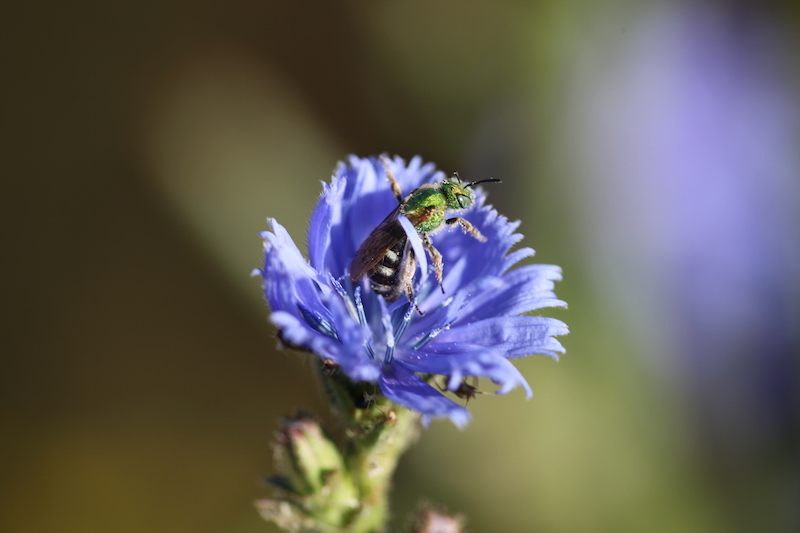 Agapostemon virescens, a native ground nesting sweat bee working a chicory inflorescence. Chicory pollen, visible on the stamens an the bee’s hind leg, is white. We direct sow the raw chicory seed on beds rather than using starts. Our brief called for the development of a head in field-grown plants during the month of February. These were, in our experience, the most tender and least bitter relative to the later heads. Field harvest diverges from the Italian practice of lifting the roots from the field and forcing greens in muddy lagoons under shade cloth. Direct sowing and field harvest reduces labor costs. The desired leaves are spoon shaped, sporting a red blade without any of the white venation typical of the early Treviso types. The white rib of the leaf must be sharply defined. We diverged from the classic Italian brief by allowing any red found in the thesaurus, from alizarin to wine, rather than a uniform shade, as well as a looser assemblage of the leaves conferring a more floral appearance. Our brief offers a more playful and informal salad “green” than the Italian standard without sacrificing quality. We joke that it is a digital food; you just can’t resist eating it with your fingers. It is equally good in a risotto or grilled. Editing the first selection, which was done in early February, reduces that selection by about 10 percent. 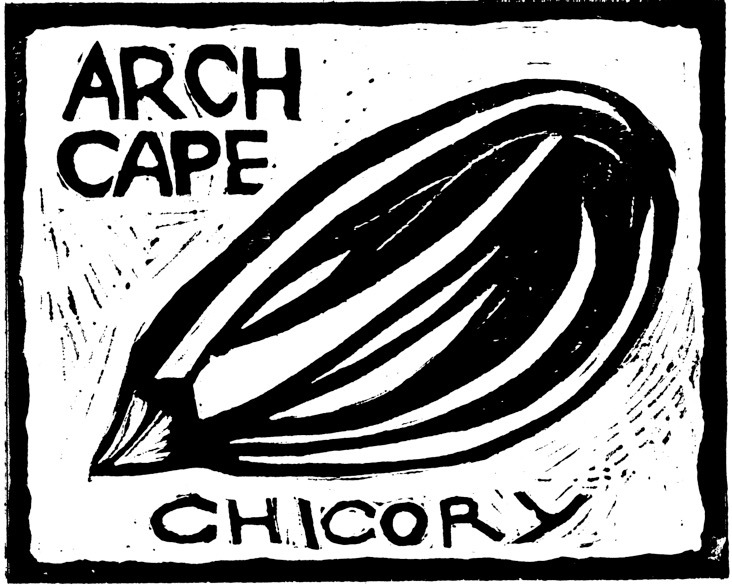 For those wanting to follow our path and produce their own chicory seed, here are a couple of additional observations. Cichorium intybus is largely pollinated by native bees and it is important to cut down any flowering stalks of naturalized members of the species that grow in the neighborhood, commonly known as “blue sailors.” When selecting candidates for seed production, flag the best-looking plants just prior to harvesting. After harvest, remove the rest of the plants, leaving only the flagged selections. Selection is a reductive process, so you will need to revisit your selections several times to make sure they meet your brief. For example, we remove the flags if the plant shows any sign of hairiness, an unfortunate trait, or disease. For varieties where a tight head is selected, you may need to open the top of the head so the flowering stalk can emerge. On our farm, we leave the seed plants to flower in place, though you can transplant them if desired. 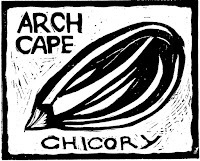 Label, designed and hand-cut by Anthony Boutard. The seeds are found in the florets left after pollination. After they dry, we strip off the florets from the flower stalks and, when time permits, run them through a cheap, hand-cranked steel burr mill. The seed is then sieved and winnowed. The removal of the seed and cleaning are time-consuming and reserved for the winter months.